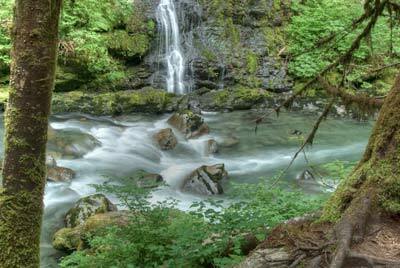 The most important rule for shooting waterfalls (and all sorts of moving water): Use a slow shutter speed. While I'm not a huge fan of camping or long, multi-day hiking trips, I do love visiting waterfalls. There's something about the rush of water that's both exciting and beautiful. It's one of my favorite photographic subjects. Taken with a slow shutter speed, water blurs into a deceptively tranquil image that effectively conveys the impression of motion in a still photograph--not entirely unlike shooting fireworks . 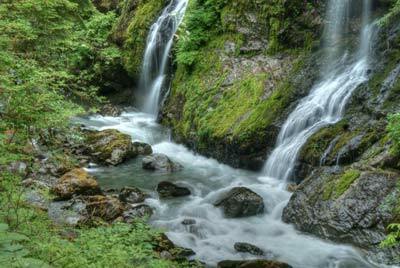 Let's take a look at how to capture some exciting and attractive photos of water in motion, so you're all set to go when the time comes to grab your camera and hiking shoes. 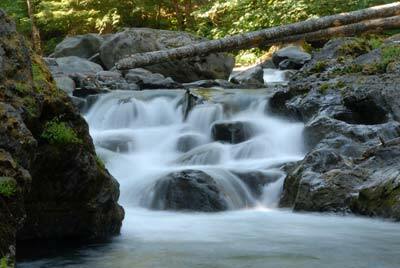 The most important rule for shooting waterfalls (and all sorts of moving water): Use a slow shutter speed. How slow? Anywhere from about a half second to 2 seconds will do nicely. If you use a very fast shutter speed, you will freeze the motion of the water, like the shot on the left. The longer the shutter stays open, the blurrier things get. Here's what you can expect with about a second. As you can see, the longer the exposure, the blurrier and more abstract your scene becomes. Since you need to shoot with a slow shutter speed, you should set your camera to its Shutter Priority or Aperture Priority mode and dial in an appropriate shutter setting. Be sure that your camera is set to the lowest possible ISO, since a higher ISO setting will make the camera more sensitive to light, and therefore shoot with relatively faster shutter speeds. In addition, be sure to mount the camera on a tripod. You've probably noticed that I recommend tripods a lot, but this is one of those situations in which it's pretty much essential. Without one, your photo will be a blurry mess. Since the shutter will be open for a while, even slight vibrations can blur the overall photo. When I shoot waterfalls, I use a remote trigger for my camera. A remote trigger can come in the form of a wireless remote or a cable that plugs into your camera, so you might want to check your camera's user guide to see if such an option is compatible with your model. Capturing those dreamy, blurry waterfalls and river rapids is pretty easy once you figure out the basics--stuff like using a tripod and a setting a slow shutter speed. You might notice, though, that some parts of your photos turn out somewhat overexposed. The problem is that the total range of exposures, from the bright, reflective water to the darker foliage and shadows, is greater than your camera is capable of capturing in a single shot. One popular solution is to use a neutral density filter. A neutral density filter screws onto the front of your lens (if your lens has threads, as do most Digital SLR lenses, and some point-and-shoot cameras) and reduces the amount of light reaching your camera's sensor. That will help reduce or eliminate the worst of the overexposures. Another option is to take a series of photos at different exposures and combine them afterwards using High Dynamic Range software. If your camera has a bracketing mode, it's easy to take a series of three or five photos at varying levels of under- and over-exposure. I explained how to create HDR photos in my two-part series, "Stunning Photos With High Dynamic Range, Part 1" and "Stunning Photos With High Dynamic Range, Part 2." This is a fun technique to experiment with, and--if you have access to HDR software like Photomatix Pro--you can get waterfalls with significantly more color and detail in the water than with an ordinary, single exposure at mid-day.